If you live in a city somewhere in the world, then you’ll know the highs and lows of metropolitan life. On the up side there’s buzz, and bakeries, bars and brasseries opening all the time. There’s culture, whether it’s theater or museums you like. In fact, whatever you’re into is on your doorstep, be it food, fashion, friends, or fun. But there are down-sides too, don’t forget. Who here likes bumper-to-bumper driving, or metro trains so packed you’ve no option but to park your face in someone’s armpit? What about those huge queues at the ATM or the feeling, frankly, that you could do with a breath of fresh air? If you’re an urbanite, you’d better brace yourself for more of the good and bad of the city. Just 100 years ago, less than 5% of the world’s population lived in cities. In 2008, for the first time in humanity, that figure exceeded 50% and by 2050, the number will have reached 70%, representing 6.4 billion people. In the last two decades, the urban population of the developing world has grown by an average of 3 million people per week! If reading about this extreme push towards urbanization has got you feeling claustrophobic and in serious need of a cottage out in the country, then Camille Pissarro (1830 – 1903) is here to help with a painting that shows delight in the city scrum. While not the most famous of the Impressionists, Pissarro played a part in binding the movement together (he was the only artist to participate in all eight of their shows, for example). 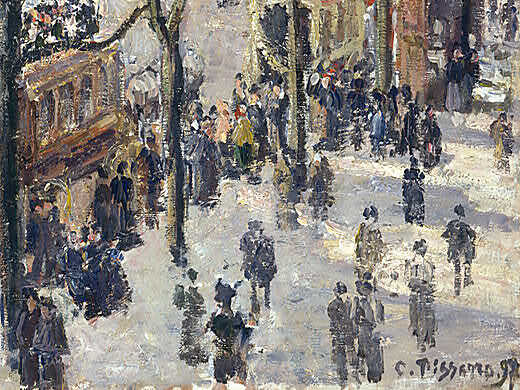 As an Impressionist, Pissarro liked painting outdoors but later in life, when ill health prevented this, he’d paint street scenes from hotel windows. Boulevard des Italiens, Morning, Sunlight (1897) is just such a scene, showing one of the four ‘grand boulevards’ in Paris (named after the Théâtre des Italiens built on it in 1700s, now replaced by the Opéra-Comique). 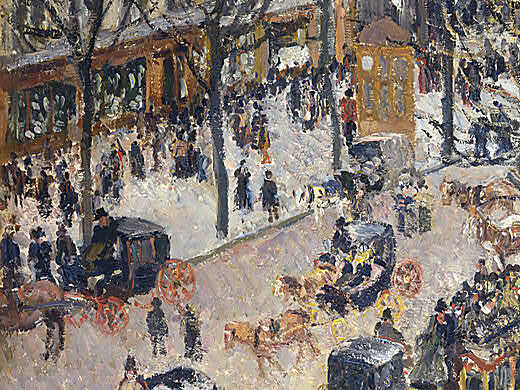 Pissarro anchors the composition with the large road running into the picture. His screens of trees add a feeling of depth through superimposed layers. He’s using the short-broken strokes typical of the Impressionists here, which creates that vibrating atmosphere you’ll get at the start of a busy day on a busy street. Here, those ordered building facades at the top of the picture give way to a flurry of whipping tree branches, before the chaos comes in at street level. There’s activity all around: carriages, coaches, horses and hundreds of people, clustered and milling here, isolated or in pairs there. Pissarro’s paint application is perfect for injecting a kind of unpredictable urban energy into the work: I get the feeling he’s seeing one organic organism here from his high-up hotel room. 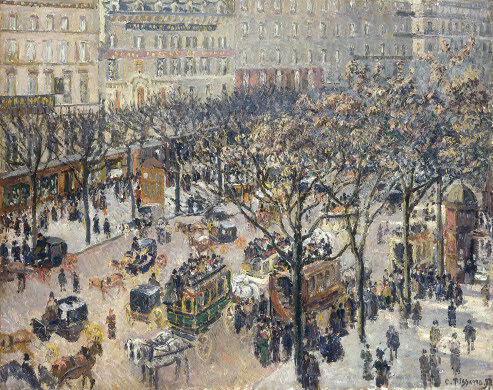 This picture shows how Pissarro takes pride in a pulsing, Parisian scene. Even late in life, he enjoys picking out the particulars of his metropolis, relishing the hustle and bustle of his human hub. During the 19th century, Paris had hosted a number of World’s Fairs. These huge public events displayed an arresting array of things such as engineering feats (the Eiffel Tower served as the entrance arch to the 1889 Exposition), and new machines and gadgets. There were often artistic and musical attractions, entertainment shows and exhibits representing peoples and places from around the world. 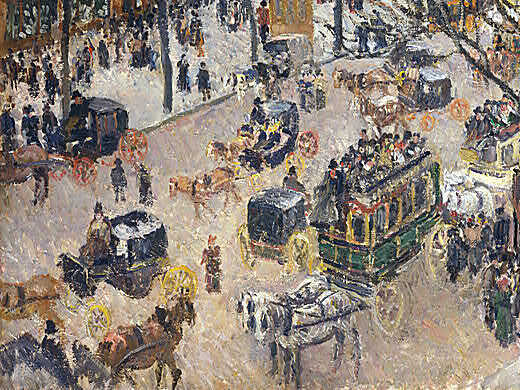 These Fairs made people feel their city was the most exciting place on earth, and Pissarro would see one more in 1900. It’s this confidence and optimism that he taps into in his picture, and it’s what we’ll want too, as we head towards incremental urbanisation. < Previous Do Painters Prefer Blondes?